Every four years, the Olympics showcase the best of the best athletes on the world's biggest stage. What would you say if I said that you can learn a lot about fundraising from a timeless and classic winter sport? That's right. Fundraising lessons are all around us. And this lesson comes from a rather unexpected place - cross-country skiing. HAVE YOU BEEN DOING SOMETHING "THAT WAY" FOR YEARS? When I moved to Montana, I fell in love at first sight - with skate skiing. I was hypnotized by the skiers' long, elegant, diagonal side-to-side movements, like a figure skater. As I was learning to skate ski, I also learned that "skating" was a relatively new sport - one that had forever changed cross-country skiing just a few short decades before. A little background. 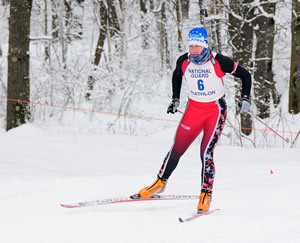 Cross-country skiing originated in Scandinavia. And for years, people skied in much the same way - kicking and gliding in straight "tracks." That is, until American Bill Koch came along and changed everything. Bill Koch was already famous for being the first American to medal at the Olympics in the classically Nordic event. He won silver in the 1976 Innsbruck Games. As of this writing, he's still the only American to medal in an Olympic cross country event. A few years after his Olympic victory, Koch was one of the first to step out of the classic tracks and apply a one-legged skate skiing technique in competition. He went on to win the 1982 World Cup. By the 1984 Olympics in Sarajevo, more and more skiers were using the technique. Think about it. Until the 1980s, people had been cross-country skiing in much the same way, literally for hundreds of years. Koch kicked the age-old "kick and glide" paradigm to the curb when he introduced the "skate" skiing technique on the world stage. He revolutionized the sport and completely changed the way that cross-country skiers compete today. What about you and your organization? When it comes to fundraising, is your nonprofit still doing the same things, in the same way, that you've done for years? I'd bet that a lot of you would answer with a qualified yes. "Because we've always done it that way." REMEMBER, "THAT WAY" ISN'T "THE ONLY WAY"
There's typically more than one way to do most things. Bill Koch found "what worked" for him. He dared to be different. And, in the process, he found a more effective, more efficient way to ski. After seeing Koch's success, skiers who had been doing the same thing, the same way, for years and years, changed the way they did things, too. What about you and your nonprofit? Are you running the same fundraising event, year after year? Are you asking the same foundations, for the same grants? Are you stuck in a "we've always done it that way" mentality? Maybe it's time to do things differently. I have a terrific fundraising effectiveness exercise that will help you think about the way you raise money. What's working? What's not? And what could you do differently? This exercise asks you to think about what you're currently doing to raise money. How much you raise, and how much time and money do you spend to raise those dollars? It also encourages you to look at what else you could do to raise money. Are there other activities that would take less time and less money and also allow you to raise more money, more effectively and more efficiently? I encourage you to click here to get the exercise, then use it to think about what's working for you with respect to your fundraising. Think about where there's room for improvement. Then decide if you're willing to try something new. Remember, there's no one single way to raise money - and there's no one best way (although there are some ways that are better than others). You want to set goals, measure your success, and find what works for you. Need help evaluating the effectiveness of your fundraising activities? Laura Rhodes can help.